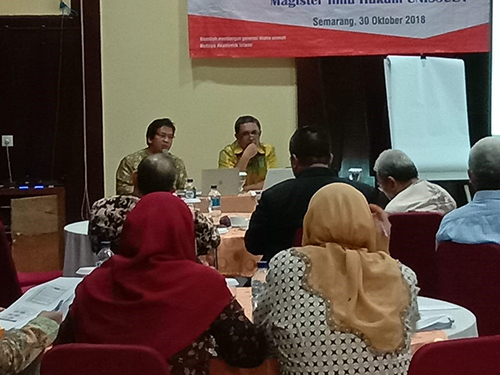 Master of Law (MIH) Unissula held a Curriculum Workshop with the theme “Pemantapan Kurikulum Demi Terwujudnya Visi Magister Ilmu Hukum (MIH) Unissula (Strengthening the Curriculum for the Realization of the Vision of the Master of Law (MIH) Unissula)” in Semesta Hotel, Semarang. (30/10). The speakers were Inspector General of The Research, Technology and Higher Education Ministry (Kemenristekdikti) Prof. Dr. Jamal Wiwoho SH., M.Hum with participants from lecturers from various universities. In his presentation, Jamal Wiwoho stated that in general the Higher Education curriculum must have referred to the National Education Standards (SNP) as stated in the National Education System Law and the National Standards for Higher Education (SNPT) Law No. 12 of 2012 concerning Higher Education. “According to SNP, the curriculum must pay attention to the increase in Imtaq, morality, potential, intelligence, and interest in the demands of the work field; the development of science and technology, the dynamics of global development and national unity” Jamal explained. Meanwhile, related to the curriculum paradigm, as a program, study programs at PT (Higher Education), including Master of Law (MIH), needed to ensure that there is coherence between design, learning and outcomes. The curriculum design contains profiles, achievement of graduate learning (CPL), courses, and a series of courses (curriculum structure). For learning, processes and assessments must be considered, as well as the environment, facilities and infrastructure. If that goes well, the expected outcome is that the graduates have the ability in accordance with graduate learning outcomes (CPL). The Director of MIH Unissula Dr. Umar Ma’ruf SH SpN MHum in his presentation stated that the MIH Unissula curriculum was in accordance with what was determined by the Ministry of Research, Technology and Higher Education as Permenristekdikti regulation no. 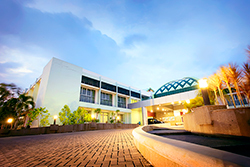 44 of 2015 concerning the National Standards for Higher Education. “This workshop is the spirit of strengthening the curriculum, this strengthening is mainly placed on the silabi of courses that are adapted to the conditions and dynamics of legal developments that occur in state and community,” Umar concluded.